Ready for another whiskey brand from the titans of bourbon at Buffalo Trace? The Kentucky distillery is upgrading a long-suffering brand, Old Charter, and spinning it off with a new line of premium, limited edition bourbons under the tweaked Old Charter Oak banner. You can think of Old Charter Oak as akin to the Col. E.H. Taylor line, with unique expressions being released two or three times each year and in varying, limited quantities — some as one-off releases, some repeated. The concept with Old Charter Oak is that every expression will be aged in a different type of oak barrels, the result of experiments that Buffalo Trace has been running for more than 12 years, using oak sourced from all over the globe. The first of these, which arrives on the market in December, is a bourbon aged in Mongolian Oak barrels, wood which it took Buffalo Trace two years to procure. 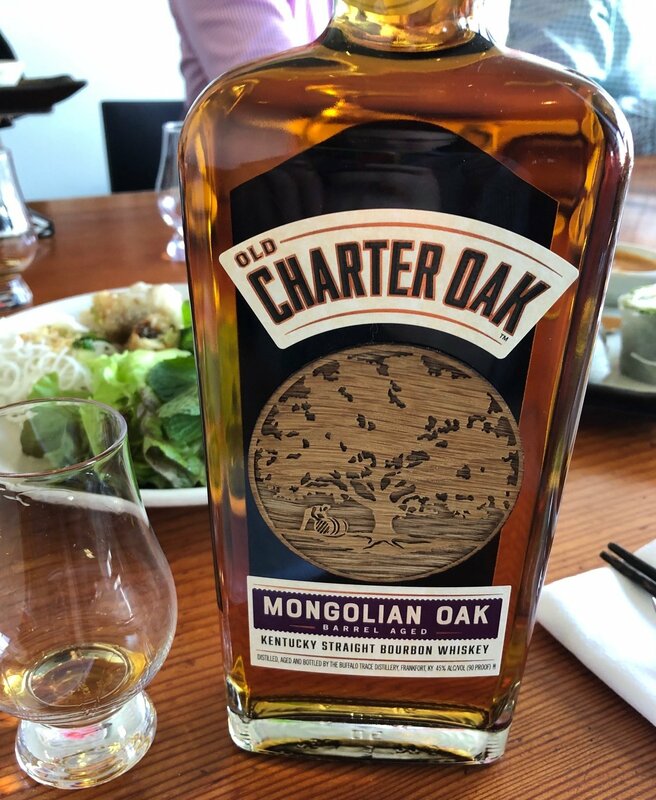 I was fortunate enough to taste the new Mongolian Oak bourbon at a small lunch for press before the recent WhiskyFest San Francisco show. Thoughts follow. It’s a bold and quite savory whiskey, with overtones of smoky bacon, eucalyptus, and old Oriental rugs on the nose, an aggressive yet austere attack which promises big things ahead. The palate is deeply, intensely woody — though not in the typical lumberyard sense — with loads of sultry charcoal and barrel char filtered through a racy spiciness that is clearly the result of the unique species of wood used. A floral element eventually emerges alongside a touch of raisin, lightening up the brooding whiskey with a little lively fruit, adding nuance to the experience. Finally, there’s the finish, which is surprisingly soft and decidedly inviting, making the whiskey hard to put down. My advice: Grab it on sight if you come across a bottle next month. As a side note, I was also lucky enough to preview the next two expressions in the Old Charter Oak line, though both were barrel samples from not-quite-finished whiskeys. In 2019, watch for Old Charter Oak French Oak and Old Charter Oak Canadian Oak. The French Oak expression (coming in the spring) is considerably sweeter but really engaging, with a heavy vanilla influence and tons of fruit, while the Canadian Oak (late 2019) came across as a wildly different, less impactful whiskey that bordered on candylike, with loads of almond paste and butterscotch notes. Watch for full reviews of these new Old Charter Oak expressions when they arrive next year. Old Charter 101. 2009. Just getting into bourbon, thought it was great, it vanished from the shelves. Sad emoji.